← I can’t wait for this year’s baseball season to begin . . . In Sunday’s San Francisco Chronicle, I’ve got a review of Jonathan Franzen’s new collection of essays, Farther Away. While I liked it less than most — I call it “the book of a writer who’s calming down” — that’s only because I liked Franzen’s earlier nonfiction so much. I especially admire “Why Bother?,” which revises and improves on Franzen’s “Perchance to Dream” (better known as “the Harper’s essay”). While researching the review, I found an interesting parallel between “Why Bother?” and “Pain Won’t Kill You,” the first essay in Farther Away, and I’d like to flesh it out here. But first, it’s worth noting how “Perchance to Dream” became “the Harper’s essay.” As I explain in my review, this happened largely during the publication of The Corrections. 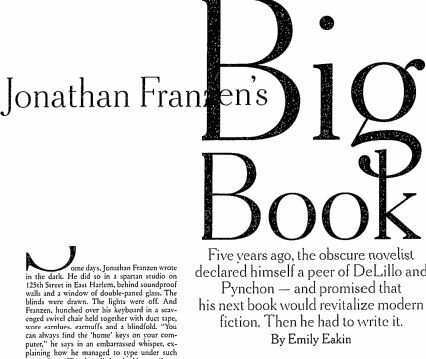 Inteviewers kept asking Franzen whether the new novel made good on his promise to “revitalize modern fiction,” as the New York Times Magazine put it in a big profile. The Times traced this back to “Perchance to Dream,” but the essay never made such a promise. Indeed, Franzen has blamed this line of questioning on the Times — and on the interviewers who hadn’t read his essay or his novel. I suspect there’s some truth to this, though I’d also note that the essay’s list of things to stop fretting about (TV, politics, whatever) is presented with such persuasive grumpiness that it’s easy to focus simply on that. Anyway, when it came time to publish How to Be Alone, Franzen’s first collection of nonfiction, he decided to revise “Perchance” — reordering some paragraphs, removing sour tangents on lit theory and Hollywood screenwriting, cutting a long quotation from a letter by David Foster Wallace. This last edit is pretty interesting, given the competitive relationship between the two authors. One way to understand Farther Away is as a reflection of that relationship — not only in the title essay, on Wallace’s suicide, but in subtler echoes like the fact that Franzen gave “Pain Won’t Kill You” as the commencement address at Kenyon, where Wallace also gave a widely-admired address. But the larger point is that Franzen’s revisions (and his renaming, from “Perchance” to “Why Bother?”) clarified his essay’s argument. In the introduction to How to Be Alone, Franzen positions the book as “a record of a movement away from an angry and frightened isolation toward an acceptance — even a celebration — of being a reader and a writer.” The Harper’s essay records that same movement. It’s the story of how a person went from caring so much he began to despair to caring just enough that he wanted to do better. What caused Franzen to change? In his essay, it’s a conversation with a linguistic anthropologist who helped him understand the history and reality of literary reading. In his life, it seems to have been the end of his marriage. Franzen told the Times that he and his wife had lived in “shared monastic seclusion” — sharing a tiny apartment where they both wrote eight hours a day, then read another five. After his divorce, he began making more of an effort to get out into the world. “It would be easy to cast him as the ink-stained wretch who lives in an oubliette and come out blinking into the sunshine every once in a while,” Wallace told the Times. “But Jon finds contact with humans nourishing.” I’d also bet that Wallace’s friendship and letters had more to do with Franzen’s growth than we currently realize (and vice versa). Whatever the causes, Franzen did change. He describes this in the Harper’s essay as “the shift from depressive realism to tragic realism — from being immobilized by darkness to being sustained by it.” It was this sustainable worldview that allowed him to finish The Corrections. It’s a long story, but basically I fell in love with birds. I did this not without significant resistance, because it’s very uncool to be a birdwatcher, because anything that betrays real passion is by definition uncool. But little by little, in spite of myself, I developed this passion, and although one half of a passion is obsession, the other half is love. And so, yes, I kept a meticulous list of the birds I’d seen, and, yes, I went to inordinate lengths to see new species. But no less important, whenever I looked at a bird, any bird, even a pigeon or a sparrow, I could feel my heart overflow with love. . . .
[By] not merely liking nature but loving a specific and vital part of it, I had no choice but to start worrying about the environment again. The news on that front was no better than when I’d decided to quit worrying about it — was considerably worse, in fact — but now those threatened forests and wetlands and oceans weren’t just pretty scenes for me to enjoy. They were the home of animals I loved. And here’s where a curious paradox emerged. My anger and pain and despair about the planet were only increased by my concern for wild birds, and yet, as I began to get involved in bird conservation and learned more about the many threats that birds face, it became, strangely, easier, not harder, to live with my anger and despair and pain. Franzen’s point in this essay is that love — ugly, messy love — improved his relationship with the world. But it makes me think of his earlier essay, too. It’s not for nothing that Franzen’s description of love (“a bottomless empathy, born out of the heart’s revelation that another person is every bit as real as you”) sounds a lot like his description of fiction. And I think this shift — from anger-driven environmentalism to love-driven environmentalism, or from depressive realism to tragic realism — explains much of what makes Franzen such a powerful and exasperating writer. It’s why he can seem so cranky and ambivalent. (With categories like these, you’re never entirely one or the other.) But it’s also why he can be so moving and provocative.